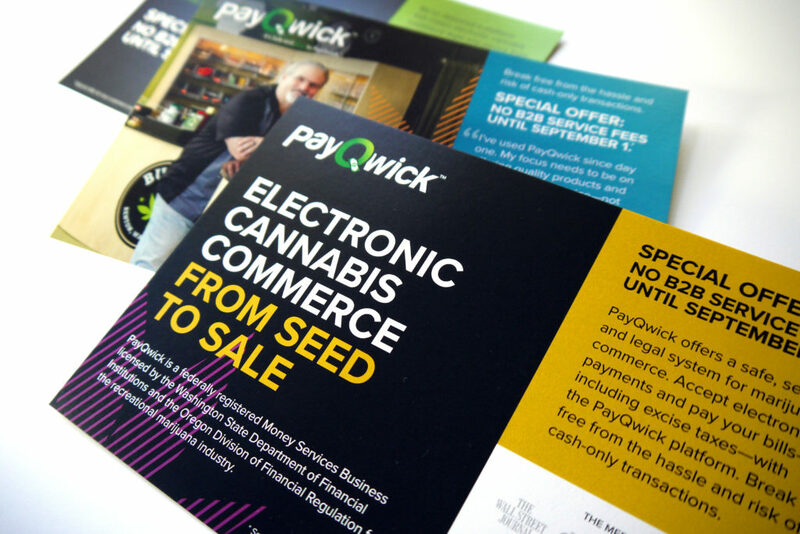 PayQwick was the first federally registered money services business for the recreational marijuana industry, beginning their operations in Washington state in 2015 and moving into Oregon in 2016. Their platform addresses the need for a safe, secure and legal system of marijuana commerce. Without PayQwick, retailers and producers / processors are saddled with cash-only transactions and struggle with the issue of holding large amounts of cash on site, making them targets for robbery. Paying bills and taxes is also a difficult process, requiring individuals to physically deliver cash in order to pay—a nightmare for both the payer and the recipient. Plus, carrying around smelly cash gets some raised eyebrows. 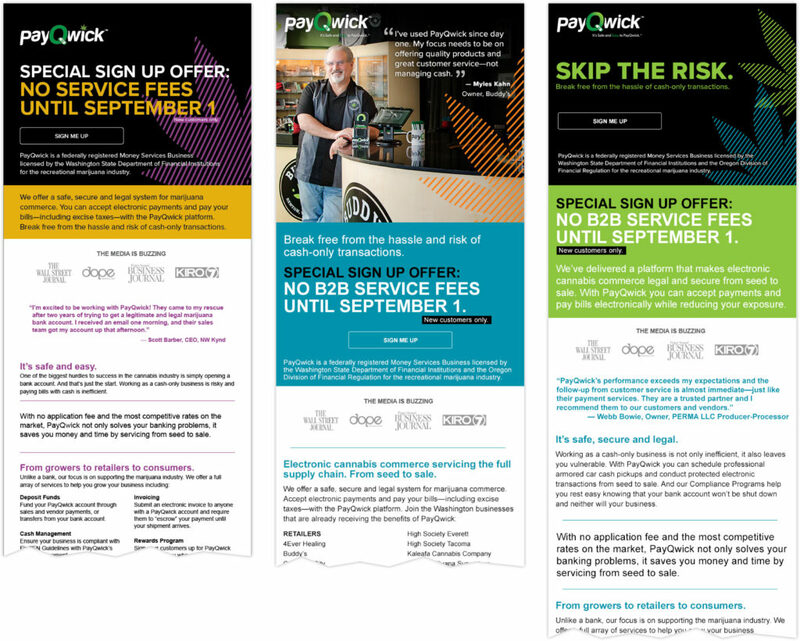 The PayQwick sales team struggled with credibility from business owners who assumed their only choice was the traditional route: banks. This campaign focused on elevating the creative and messaging, creating awareness within the marijuana industry and warming leads for the sales team. Began with a brand refresh. 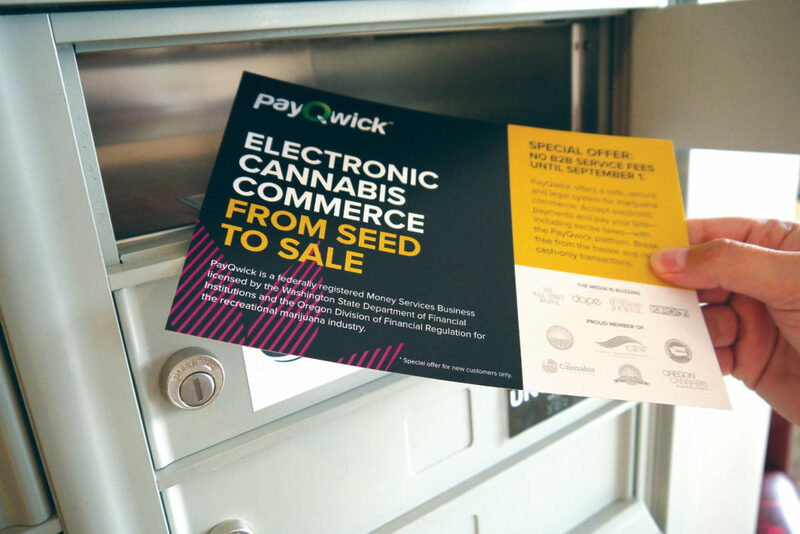 In this burgeoning industry, PayQwick needed to break away from the expected (and ubiquitous) black and green—yet also provide visual cues to their target audience that they service the marijuana industry. The Q&A team developed a standard of color usage, pattern, photography and messaging that communicated trust, authenticity and industry. This first step served as the foundation for the direct response campaign. Field research and data analysis helped fuel the strategy for the initial touchpoints. We focused on three key factors: the introduction, credibility through those who already put their trust in PayQwick, and position PayQwick as the way to avoid inherent risks with weed businesses. The direct response portion of the campaign included three postcards and companion email series. The email campaign had a 16.5% increase in average open rates. An A/B test, setting the new campaign against the legacy artwork, saw a dramatic 775% increase in the click-through rate.